Aquamarine happens to be one of the most popular gemstones of them all. Most Americans choose blue as their favorite color. So it’s no surprise that aquamarine exerts a powerful allure that reaches far beyond its status as March’s birthstone. In fact, Aquamarine happens to be one of the most popular gemstones of them all. In the late 1980s, three Brazilian prospectors discovered a meter-long aquamarine of exceptional clarity and color. They accidentally dropped it, breaking it into two pieces, one of them two feet long. They sold the pieces, and the two-foot piece weighing 60 pounds found its way into the hands of connoisseurs who realized its importance. Eventually, it was sold to a German Brazilian consortium. One member was the distinguished gem cutter Bernd Munsteiner. Word had spread of its existence, and getting it safely out of Brazil proved a challenge. It finally reached Munsteiner. 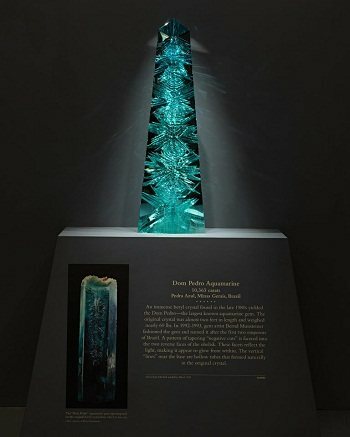 He spent four months studying it and six months cutting and faceting it into 10,363-carat obelisk that is 35 centimeters tall and 10 centimeters wide at the base. It is estimated to still have $5,000,000 -$6,000,000 worth of aquamarine in it. Today the Dom Pedro, as it is called, sits in the Smithsonian Institute. The Dom Pedro will be on display next to the Hope Diamond–an honor those who have seen it know it deserves. "The eye cannot rest on Dom Pedro," Brian Vastag wrote. "It is drawn upward to the pyramid tip by an eight-fold set of climbing carved starbursts that flare and shimmer like the beating wings of iridescent angels." It was a gift from collectors Jane Mitchell and her husband Jeffrey Bland.